Monday, February 5, 1912: Back to my lessons again, I resolve to study until twelve, but it is more likely to be ten or a little later. Yesterday, I wrote about how the church that Grandma attended closed a few years after she wrote these diary entries. Since the diary entry that I’m posting today is self-explanatory, I’m going to continue telling you about country churches in 1912. A hundred years ago there were many more small churches in rural hamlets than there are now. The Country Life Movement, which sought to revitalize rural life in an era when many youth were leaving rural areas for the cities, was at its peak in 1912. The media, many government officials, policymakers, and academics saw the churches as having a key role in this rural revitalization. However, many of these churches were very small and struggling—and needed to revitalize themselves if they were to play a larger role in rural revitalization. 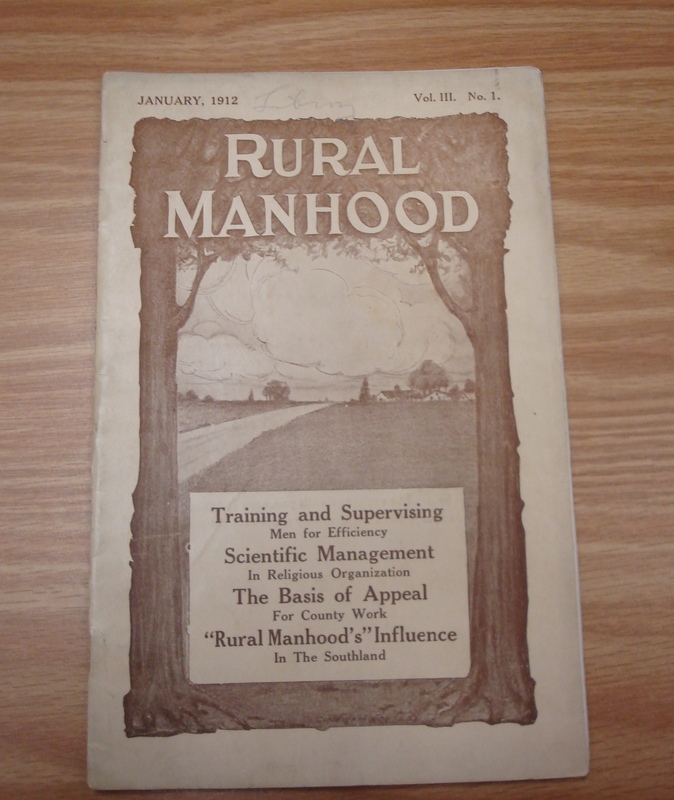 An article on country churches in a 1912 issue of a magazine published by the YMCA called Rural Manhood listed some “elements of weaknesses” and suggested principles that would lead to country church improvement. 1. The chief element in the problem is the inevitable isolation in the open country and the depletion in thousands of villages; not merely in the loss in numbers, but in the improvement of the life of many of those who remain. 2. The element of Economic weakness: Impoverished soil, poor agricultural conditions and bad farming, which are found all too frequently. 3. Element of Business weakness. We seldom find any business system in the country church. As a rule, they have no financial policy, no plan for the future. 4. The element of Wasteful Competition, Altogether too many rival churches, due to the excessive individualism and lack of social co-operation, or the depletion of a once populous village, or the early blinders of too zealous denominational strategy. Wasteful sectarianism is a sin in the city, but it is a crime in the country. 5. Element of Moral Ineffectiveness: Many country churches have lost the respect of their communities and their local support, because of their lack of vital religion, of deeds of spiritual power for character making, because they do not prove their genuine brotherliness in an unselfish service of the community. 6. The element of Narrow Vision of service: The country church is often slow in responding to the progressive spirit of the times, and has little idea of the modern social vision. Few country churches as yet are seeing their great opportunity to serve broadly all the interests and needs of the whole community. 7. Lastly, the weakness is Leadership. The country ministry is in general an untrained ministry. 1. We must study the country church, or any other church, not as a machine, but as an organism, and we should remember that a body becomes as it functions. It develops by doing, or it dies from atrophy. 2. The pathway to success is adjustment to the environment. This necessitates a scientific, inductive method of careful study of environment and social contacts. 3. We must follow the natural method of redemption through resident forces, including of course among all personal forces, the might of the immanent God. 4. We must adopt modern business principles in the work of the church; Conservation of resources, combination of forces, elimination of waste and friction, for maximum efficiency. 5. As churches we must accept Jesus’ law of self-sacrifice for the sake of the Kingdom. We must subordinate selfish personal preferences to community needs. Since Grandma’s church, the McEwensville Baptist Church, was disbanded around 1920 it must not have been able to move beyond some of its weaknesses. Posted on February 5, 2012 July 11, 2012 by SherylPosted in OtherTagged 100 years ago, 1912, Country Life Movement, diary, rural. When we lived in rural Mississippi in the 1970s-1980s there were so many little churches. They were small but seemed to be thriving. I think there were so many because they started up within walking distance of people. My grandparents are of the same generation as Helena. The churches they attended in rural Mississippi still exist. They do the same things they did a hundred years ago. Pastor comes once or twice a month, decent Sunday school department and good choir. Membership is steady. It’s great that many of the rural churches in some parts of the country are doing fine. In central Pennsylvania many of the small, old churches have closed or consolidated with other nearby churches. And, some of the small churches that remain are really struggling–though others are doing okay. For example, in McEwensville a hundred years ago there were three churches–Baptist, Lutheran, and Reformed (United Church of Christ). Now there is just one–the Reformed one. As I mentioned in the post, the Baptist one closed many years ago. And, the Lutheran one closed about 10 years ago when it consolidated with another Lutheran church in a nearby town. I think this would be fairly typical for the area.